We live in a physical world. As such, we are readily aware that we have a body. If we stop to contemplate it, we may admit to the possibility of having a soul, too—whatever that means. But what about a spirit? In our reality, which we readily see and experience, the idea of spirit seems a bit of a stretch. Yet, Paul writes that we are comprised of body, soul, and spirit (1 Thessalonians 5:23). However, he reverses the order. He lists spirit first, as if it is most important, then soul, and lastly body, almost as inconsequential. 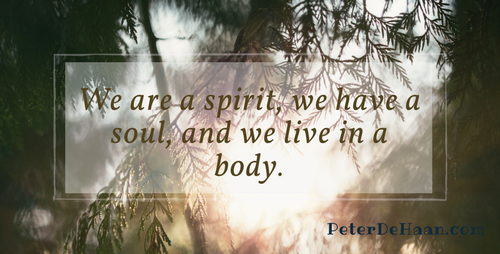 Though I don’t know the origin, I’ve heard it said, “We are a spirit, we have a soul, and we live in a body.” That saying is likely built on Paul’s teaching. Furthermore, our soul is said to comprise our mind, will, and emotion. The more I think about it, the more I am intrigued—and the more I like the order of the words: spirit, soul, body. We know our body is temporary; that is obvious. It will one day cease to function, and we will “die.” Yet, our spirit will live on. This suggests our spirit is more important and significant than our body. If so, our spirit and soul should control our body, not our body dictating our soul or spirit. Consider eating. Our body wants food, so we feed it, sometimes gaining weight in the process. Then we go on a diet. Our soul (mind, will, and emotion) resists the body’s insatiable call for more. If we’re successful, we lose weight. But do we keep it off? Not likely—not unless our spirit gets involved. When our spirit is in control, our soul follows, and we keep our body’s cravings in check. We are a spirit, we have a soul, and we live in a body. This gives us much to consider and can reform our reality, if we will let it.